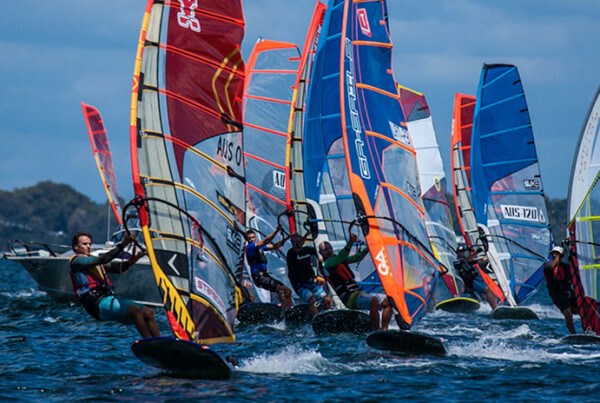 Buoy roundings are an important part of any windsurfing race and a key area to make (or lose) places and positions in a race. Done correctly, bottom buoy roundings can set up your position for the next upwind beat and create opportunities for passing or protecting a lead early on in the next upwind beat. Top buoy roundings are equally important as they set up the lines taken on the downwind run. Correct buoy roundings involve a small number of steps; here we will discuss them all. Rounding the bottom buoy, whether a gate or a single mark, to start the next upwind leg, the line you take in to the buoy will determine your line out of the buoy (as you round it). Starting the next windward leg it is important to get to your maximum upwind angle as soon as possible to gain a safe-leeward position upwind. Sailors behind you will find it difficult to pass you to windward sailing in your dirty air, however if you round the buoy too tight and take longer to start pointing on the new leg you create a space where sailors behind you could get an advantage if they round the buoy tighter. Figure 1A shows the RIGHT and WRONG lines you can take in to the bottom buoy. The RIGHT line is to head slightly deeper in the last 20-30m before the buoy travelling a few metres below the buoy and then aggressively turning upwind as you round the buoy to make a very tight angle around the buoy. The WRONG line is to head straight to the buoy and as formula boards turn much slower than waveboards it is very difficult to change direction so quickly and you will take a few metres after the buoy to get to your optimum upwind angle. Figure 1B shows the WRONG line taken in to a buoy which creates a space upwind of the sailor and the buoy which sailors behind who round the buoy correctly can use to their advantage to gain positions on the next upwind leg. To protect a lead you must take the RIGHT line around the buoy to keep all sailors behind and to leeward of you making it difficult for them to pass you in your dirty air or forcing them to tack away. The actual distance in metres between the RIGHT and WRONG lines is only approx 4-5m difference. This is not an exact figure but merely an educated guess that the sailor will judge themselves on the water nearing the buoy. When other sailors are in close proximity you must obey all the normal sailing rules and choose the best line in to the buoy that is available given the circumstances. Rounding the top buoy does not require a particular line in to the buoy. Techniques involved in rounding the top buoy will be discussed in Section 3. In Figure 2A two sailors approach the bottom buoy. Sailor 2 will not likely get clear ahead before the buoy and will have to give Sailor 1 ‘mark-room’, which essentially allows Sailor 1 to pass him to round the buoy. In this instance, the best option is for Sailor 2 to slow down dramatically, let Sailor 1 gain a distance of 10-15m ahead and then ‘ooch’ downwind as far as possible below the buoy to round extremely tight on the buoy. If you put a little pressure on Sailor 1 they will often take a very tight line in to the buoy and have to round the buoy very wide, creating a space for you to attack on the upwind like in Figure 1B. Figure 2B shows the path Sailor 2 should take if given this opportunity by the mistake of Sailor 1. Rounding the bottom buoy in medium to strong wind conditions it is important that you UNHOOK FROM THE HARNESS. 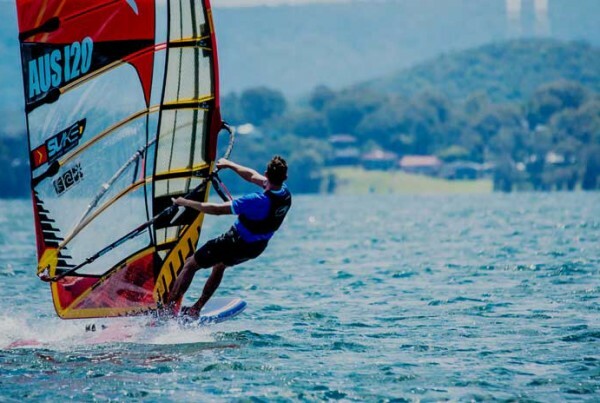 Distinct changes in direction on windsurfing boards with large fin sizes creates a large spike in load on the fin which usually causes the board to excessively rail, the nose of the board to lift and become unstable and the board to slow down very quickly. 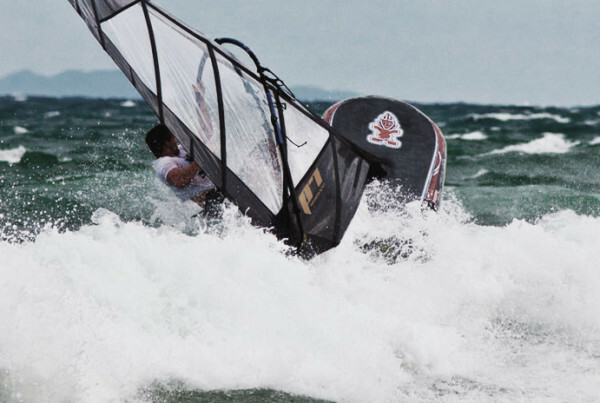 The stronger the wind gets the more this will have an effect and sailors can actually be at risk of crashing due to the behaviour of the board when the fin is maximum loaded. To help with control, unhook from the harness and keep your legs slightly bent and body weight forward to keep the nose of the board down and keep the speed up. You should be unhooking from the harness 2-4 seconds before you reach the buoy. As you round the buoy, tilt the rig back aggressively as in doing a tack to get the board to point as soon as you round the buoy. In lighter winds or if your line in to the buoy is a little too tight, you can throw in a few pumps and ‘ooch’ the board downwind (losing a bit of speed) to get yourself deeper than the buoy to have a good line close to the buoy when you round it. These extra few pumps will mean you are already out of the harness and have your body weight forward for when you round the buoy. Rounding the upwind buoy and heading to a downwind leg requires footwork and position of the rig to get the board to foot off aggressively downwind. With your front foot, pull up in the strap, lean the rig forward and shift your bodyweight forward for a few seconds while the board turns downwind. This is the same technique as initiating a gybe, except that the back foot does not move from the back footstrap as in a gybe. This is a ‘sail by feel’ technique and requires the sailor to feel the movement of the board under their feet and apply more pressure when necessary needed to push the board. In planing conditions it is important to put in a strong 3-6 pumps after rounding the buoy to get the best angle upwind after the buoy and help accelerate after the change in direction. By pumping and going for maximum height after the buoy, you will make it difficult for the sailors behind you who will usually have to foot-off to get out of your dirty air and lose considerable ground. In very strong winds it may not always be beneficial to pump however sometimes making 1 pump as you hook yourself in to the harness is good for acceleration. Training for bottom buoy roundings is very easy and requires little setup. If you have access to a buoy, place one anywhere in the water. 1- Practice approaching the buoy from a normal downwind angle 50m from the buoy. As you get 20-30m from the buoy, head deeper to get 4-5m below the normal line in to the buoy then using the techniques discussed above, round the buoy. 2- After rounding the buoy, sail upwind for 20 seconds to practice getting to maximum height and speed quickly after the buoy. 3- Repeat 10 roundings on one tack, then 10 roundings on the other tack. (Despite most courses having port rounding of the buoys, with gate courses you will inevitably need to be skilled in round buoys both directions). 1- With a partner, repeat the same as Drill 1 but start the run to the buoy from 150m away. Run in close proximity with your partner, fighting to see who can get to the buoy first. 30m from the buoy make a decision about who will arrive at the buoy first. 2- If you have overlap nearing the buoy, force yourself downwind as in the techniques discussed and try and hold your height and position around the buoy. If you are behind, practice the techniques in Section 1. 3- After rounding the buoy, sail upwind for 30 seconds to practice holding your position with a sailor behind or in front of you. 4- Repeat 10 roundings on one tack, then 10 roundings on the other tack. (Despite most courses having port rounding of the buoys, with gate courses you will inevitably need to be skilled in round buoys both directions). If you do not have the ability to use a buoy, you can practice Drill 1 with an imaginary buoy; just pick a spot on the water to practice the techniques. Be conscious of starting the manoeuvre on the exact spot on the water you have chosen. Also remember that in the Windsurfing Appendix B rules (which we use), we are ALLOWED to touch the buoys. Great advice about tactical roundings but remember when you are the right of way board (inside and overlapped) you are limited under 18.2 to a “seamanlike” rounding. Awesome article Sean. Especially for the novice racer like myself. Great stuff! Looking forward to trying out those drills when next on the bay. Good point Steve. A corrolary of this is that if you do end up outside but overlapped (because not everyone can be inside), you do need to make a judgement of skill. @ Steve, John … I just reworded that sentence underneath Figure 2A/2B as it probably wasn’t clear enough. You are both right, if there is an overlap, the outside boat is giving room to the inside boat – which is exactly when to use the tactic to back off and go deeper and try to squeak in to that windward position once you’ve rounded the mark by rounding tighter. The inside boat has less chance of doing a good mark rounding if you keep the pressure on him as he’ll be very tight in to the mark and its hard to change direction on these boards so quickly. You have to judge the distance and when to make the manoeuvre by eye, so practice makes perfect! Dead right Sean, and another excellent article too btw. What chance an article somtime on pumping for those of us who are too short for our weight? sean . just wondering bout on the first diagram about botom mark roundings .. could it posible to you into the hopelessness position? @ Nick – yes, if done correctly the sailor in green (in the first diagram) has a chance at putting the sailor in red in the hopeless position even when coming to the mark behind him. The bottom buoy rounding is very important for this reason because if you get put in to the hopeless position and port is the favoured tack to go out on, you don’t have a lot of options up your sleeve except to sit in there and take your medicine or lose out by tacking away. Vice versa the sailor who approaches the buoy first if he’s smart can close the door on the sailor behind him and keep him in the hopeless position.